Because reading is essential to every writer. What are you reading these days? Are you exploring outside of your comfort zone? Or are you revisiting old friends? I’m reading a little of both. Science fiction isn’t my strong point as a writer, though I do enjoy reading it. 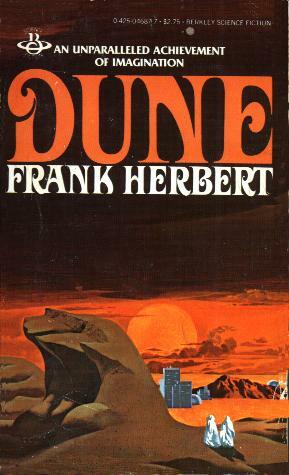 Frank Herbert’s Dune series is one of my favorites. It has been compared to the scifi equivalent of The Lord of the Rings. The masterful world-building, culture settings, political and religious vices, and, most of all, character development, has me hanging on every word. I first read Dune while I was still a young teenager. It took me a year to get through it, and I really only read it because I loved the movies so much. Well, there are no more movies, but their ARE plenty of books. Like 10+. I recently discovered that not only did Frank write more, by his son Brian also took over some of the manuscripts and completed what his father started. Their writing styles are similar, and you can tell Brian loved the world as much as his father did. So here I am. While I wait for Brian Herbert’s prequel trilogy (Dune; The Butlerian Jihad) to come in the mail, I’m revisiting the original world of Dune. And I’m hooked. The best form of science fiction I’ve ever read. What are you reading and why? Comment below. Dune is on my short list to read soon. Your review makes me want to push it closer to the top. I’m finally reading the Harry Potter series, on book 6 currently. I enjoyed the movies, my wife and daughter enjoyed the books a lot, so I thought it was about time I read the books. Glad I did. Of course, now I want to watch the movies again. Yes, I watched those movies too, and am just getting around to reading the books. I think my favorite part is the depth that the books contain which the movies cannot, understandably, encompass. As stated, the entire Dune series is over 10 books long. Think twice before delving in. 😉 But I enjoy it immensely and will continue my slow journey through the words.